Fun in the Shasta Lake sun! Today we fished Shasta Lake again. We started out looking for some big fish and after hitting some of my high percentage areas, We managed to go 2 for 2 on some nice browns. Dwight and Will elected to try for some smaller fish after catching and releasing the browns. We called it a day after landing 7 nice 16"-18" rainbows for the fish box. The fish are pretty much everywhere around the lake, but the 15'-30' range seems to be the most productive areas still. The water temps are into the low 60's now and its only going to continue to warm up. I'll likely continue to fish above 30' well into June, but keeping on top of the temps at certain depths will help to stay on the fish as the lake warms up. Still finding big browns on Shasta Lake. 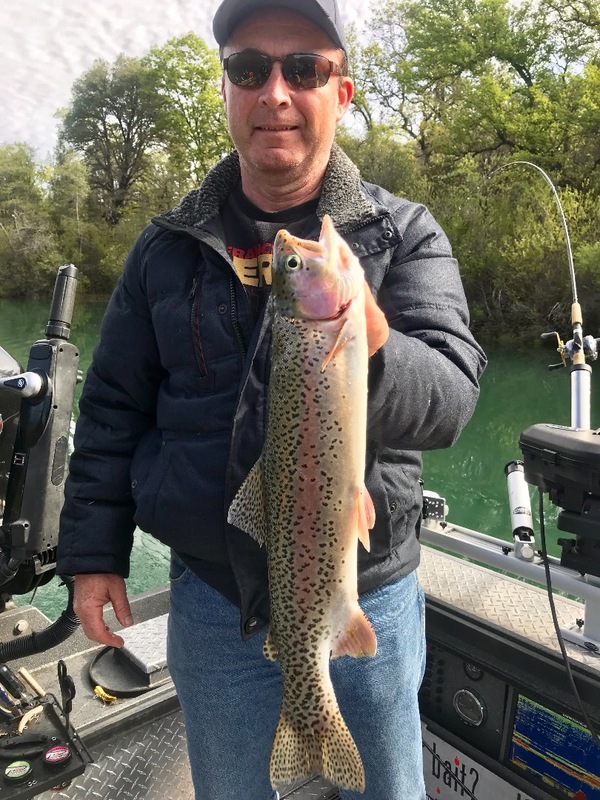 Rainbow trips are heating up in Shasta County!